Our Parks department make the city bloom throughout the year and do a wonderful job to bring colour and warmth to the City. Below you can see some of their efforts as you wander quietly through the gardens and walks around the City, away from the hustle and bustle of life that goes on at its insistent pace. Find tranquility and contemplation, or just sit under the trees and listen to the birds, feed the ducks, or play on the swings - if you are minded, in the childrens play areas. Pool Walk wanders alongside Minster pool, fronting the Cathedral as a backdrop, and runs from Dam Street through to Beacon Street. Sit in the gardens or feed the ducks. There is a car park immediately behind for easy access at the back of Woolworths. Pass along from here, and over the other side of the pool at the Beacon Street end are the Memorial Gardens with the inscription over the gates - "Pax 1918", which was when they were created, although the gates don't look that stable. A plaque at the far end of the bridge over the pool tells that the present bridge was built over the original 7 arch bridge which lies underneath. 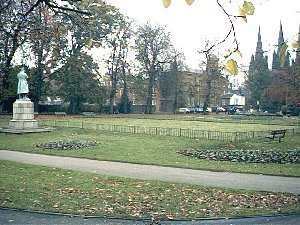 Over the road you can enter Beacon Park by the Registry Office. Here we catch a rare Autumn view of Beacon Park between floral plantings. Out came the Summer border plants, and in go the Winter pansies etc. The statute of King Edward VII stands in the foreground, not visible in the middle distance is the bowling green, behind which you can just make out another statute. This is the memorial statue to Captain Smith of Titanic fame, who came not from Lichfield but from Hanley in Stoke-on-Trent. Apparently the story goes that Stoke had the statue made but refused to errect it when he managed to sink the Titanic, so Lichfield took him on board. Since then Stoke wanted him back - but Lichfield were having none of it. It's only a story and the truth is lost somewhere, but it is a good tale. Behind the good Captain are the tennis courts and the pathways to the rest of the park. In front lies the Bowling Green, across which we look back towards the Registry Office. 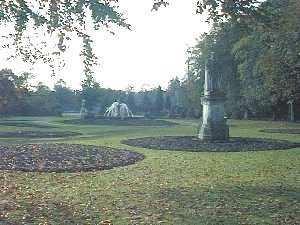 Also behind the Captain, which we can see in the picture below and to the left, is an ornamental pool surrounded by a cascade of mainly evergreen planting. The pool is not visible from this view which is maybe just as well, because when this was taken, Autumn had taken it's toll, the water level was down, and the waterfall was not running. 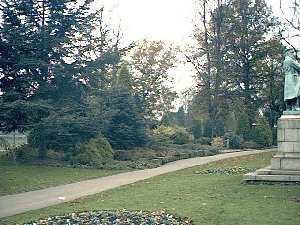 The Tennis Courts are just visible through the trees on the left of this picture, and you will find the Crown Bowling Green down the path, away from you in the picture, and follow it round to the left towards the Rose Garden. 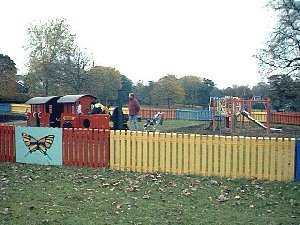 Beyond the Rose Garden, are the Playing Fields, the Boating Pool, and the children's Play Areas. The Kiddies play area is all fenced in to keep out dogs, older brothers and sisters, and parents if need be, but is a safe area for the toddlers where they can enjoy themselves on the apparatus. 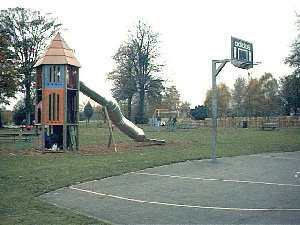 The open play area in the right hand picture above, is for older children. I think the Council must have lots of fun trying out all this equipment because it is constantly changing, and old bits and pieces are regularly replaced by the latest bit of fun. 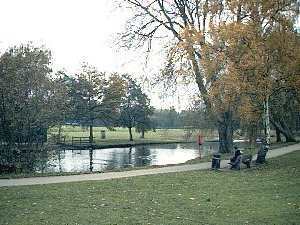 Opposite here is the boating pool, which you can see on the right, where in the summer you will find the water full of canoes and rowing boats, while now all we see are ducks, coots and the odd goose and swan - overlooked from the banks by a mole or two. 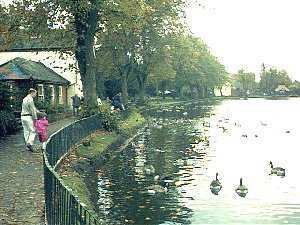 This pool is fed by Leomansley Brook, which flows through here and down to Minster Pool, and thence to Stowe Pool, where it leaks out.